Pretzel Logic's Market Charts and Analysis: SPX Captures November Targets; What Next? 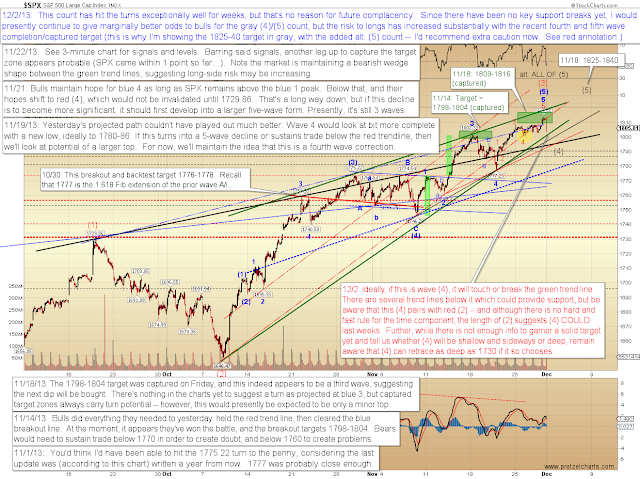 SPX Captures November Targets; What Next? On Friday, the S&P 500 (SPX) captured the next target zone, and promptly turned where it "should" for the preferred Elliott Wave count. We're now entering waters that, while not exactly dangerous yet, certainly call for added caution. Part of Elliott Wave Theory revolves around counting the number of waves in the correct way, and then anticipating (based on that count) where market will head next. For the past few weeks, the market has been unraveling fourth and fifth waves (the final waves in a series), and we've now reached a point where it becomes a game of inches. The best way I can explain this: when you count the early portion of a wave (the first and second waves), there's always at least one or two that are a bit vague. Let's draw an example, and say that you work your count and determine that there are probably 7 first and second waves, which means at the end, you'll anticipate 7 fourth and fifth waves. But one of those waves is vague -- so you're not 100% certain there are 7. You can see the potential that perhaps there are only 6 -- this means that you can have pretty high confidence in 6 fourth and fifth waves coming at the end of the series... but that final wave to make it 7 becomes a lower probability trade. This is basically where we are now. 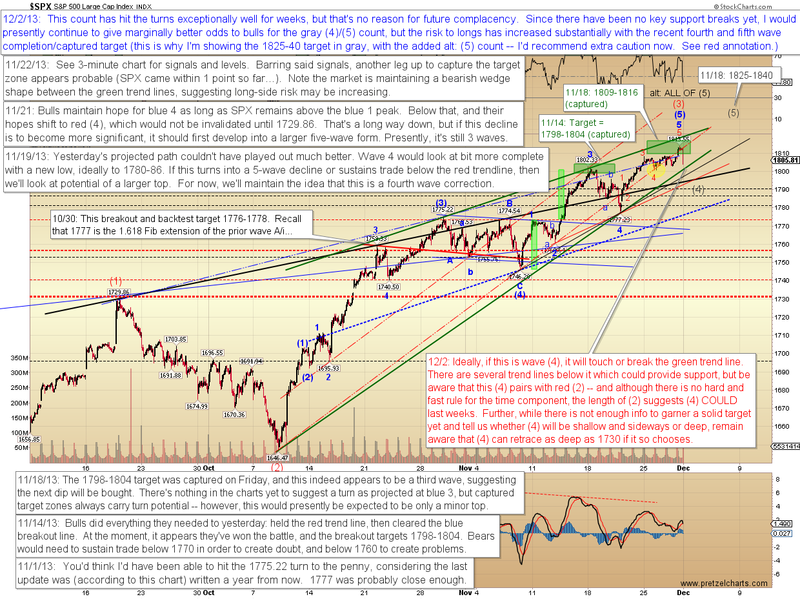 I had high confidence in the last two fifth wave rallies; however, my confidence is not as high for another one. Given the charts as of this moment, I'm still leaning toward it, but be aware that it's a higher-risk proposition and act accordingly. Also be aware that the wave count suggests we may be nearing a higher-degree fourth wave correction -- this means that the coming correction is likely to be deeper and longer-lasting than the previous two. Let's start with the 30-minute SPX chart. 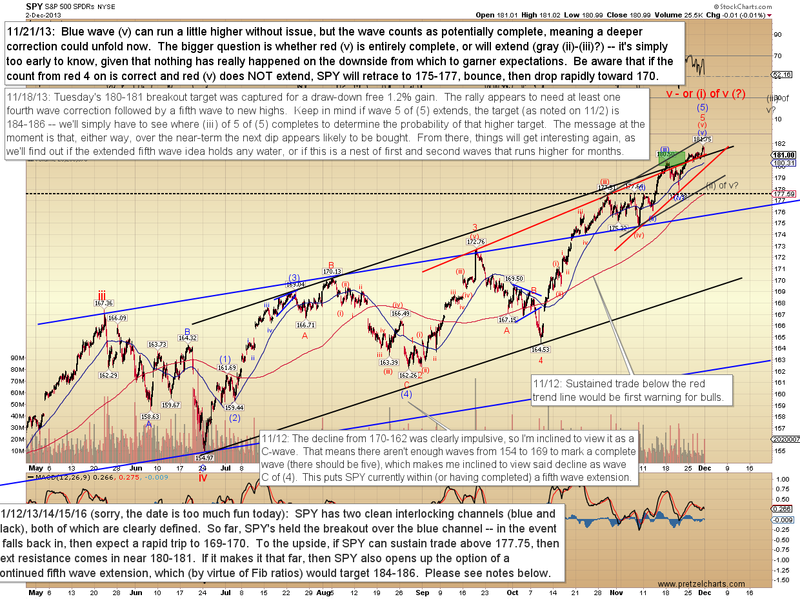 Note that the location of gray (4) is not intended as a target on this chart -- it's far too early to calculate a high percentage target for that wave, or even to confirm that gray (4) has begun (since the market has yet to form a five-wave impulsive decline for confirmation and target purposes). 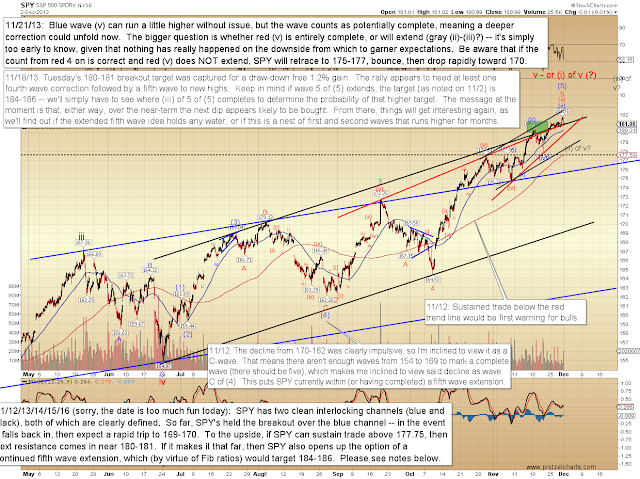 The SPX SPDR ETF (SPY) also has enough waves to count as complete, and suggests odds are increasing that a correction is looming. I'll track and update the odds and signals for the noted potential fifth wave extension as it unfolds. The Dow Jones Transportation Average (TRAN) is now bumping into the upper boundary of its long-term trend channel. In itself, this doesn't guarantee a correction -- but it certainly calls for a healthy dose of caution. In conclusion, Friday's target capture and reversal came right where the waves suggested it would, but as of yet, we do not have a five wave decline to confirm a trend change. Based on the rest of the wave count, though, in a perfect world, I'd like to see a deeper correction unfold in the near future. If the higher-degree wave count is also correct, ultimately there will be another buying opportunity down the road, for a trip into the next target zone. Trade safe. According to the Stock Trader's Almanac, the month of December is the best month for the SP500. 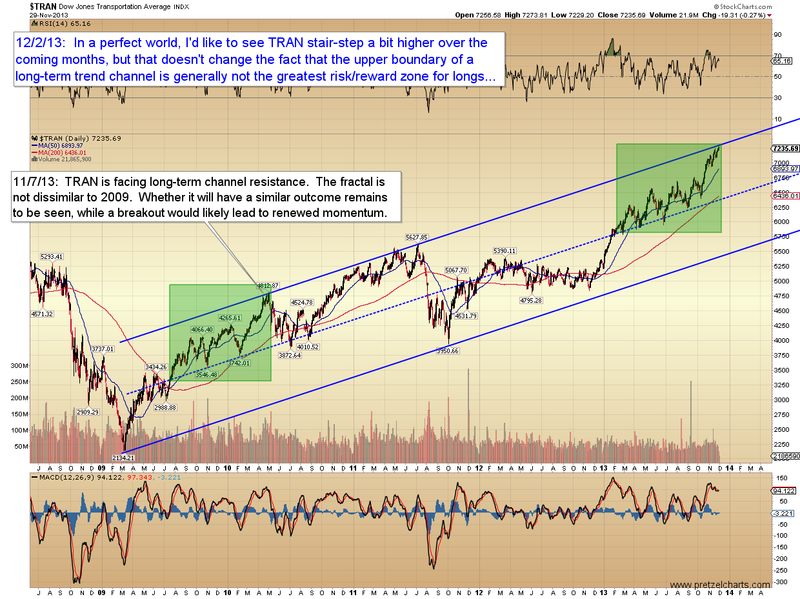 Since 1980 there have been 26 out of 33 years where the SP500 finished higher. Out of those 26 up years, December saw gains in 19 of them. That's a 73% gain rate. Maybe this year will be different ?